The lower house on Friday narrowly backed Zdenek Ondracek to head its police oversight committee. It is the first time a Communist lawmaker has held such a post since the fall of communism nearly three decades ago. The party, which opposes NATO membership and holds pro-Russian views, appears to be gaining influence as Prime Minister Andrej Babis and his ANO party seek support for a new government. While other parties have shunned Babis as he faces police charges of illegally obtaining European Union funds a decade ago, the Communists have held out the possibility of giving him their backing. Babis denies any wrongdoing. 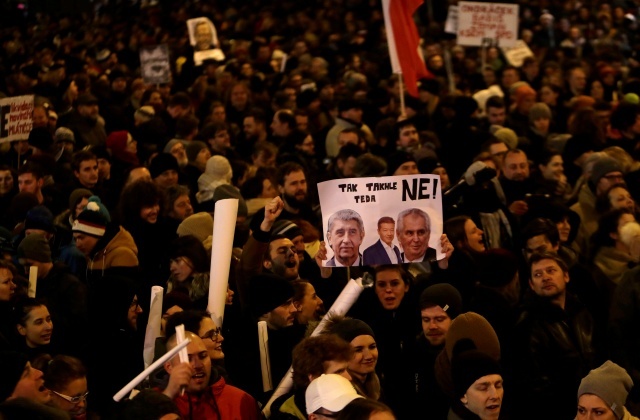 Waving Czech and European Union flags, protesters opposing the appointment of Ondracek gathered on a portion of Prague’s Wenceslas Square and shouted “We’ve had enough” and other chants, directed also at Babis. 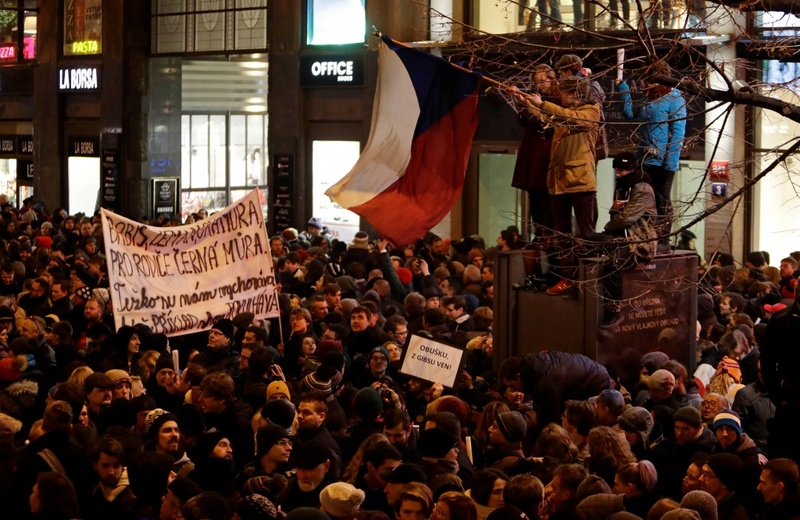 “I am here because of… Ondracek, who was a member of a police force that beat demonstrators in the Velvet Revolution,” said Jakub Kocmanek, a 32-year-old lawyer. “In the wider context, it is the election of Babis”. Police did not comment on the size of the crowds, although Czech news agency CTK and other news providers put the figure in the thousands. 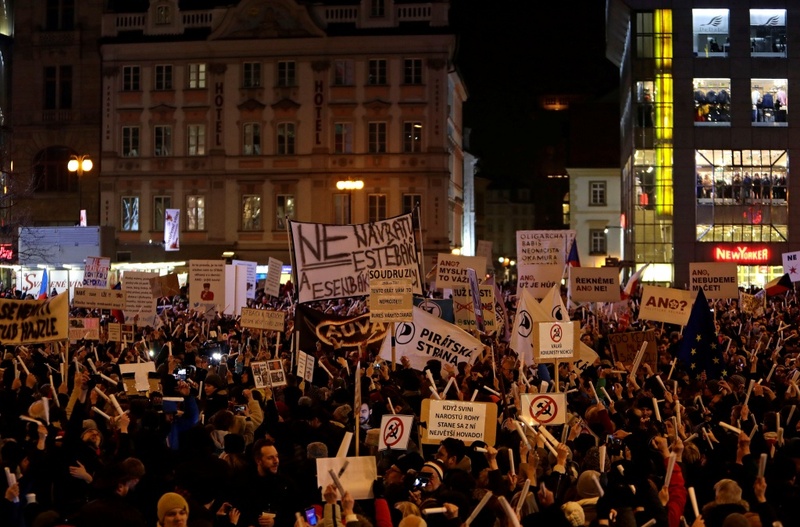 CTK, citing police, said 2,000 gathered in the second largest city Brno. Babis, a Slovak-born billionaire businessman, has also fought to be cleared of a charge of cooperating with the communist-era secret police (StB), a demand rejected by a Slovak court earlier this year. In 1989, Ondracek’s police unit used water cannon, clubs and dogs to disperse anti-regime protests. The demonstrations eventually led to the peaceful overthrow of Communist dictatorship in what became known as the Velvet Revolution. A video from 1989 posted on YouTube shows Ondracek defending police actions in an interview with state television. Babis has had trouble installing a government despite being the runaway winner of an election last October. His single-party cabinet lost a confidence vote in January. ANO is chiefly negotiating with the Social Democrats whose chairman Jan Hamacek had said the party could join an ANO-led government but Babis’ presence remained a problem. Direct or indirect support might also come from the far-right, anti-EU SPD party of Czech-Japanese businessman Tomio Okamura – which has also raised concern among opposition parties and from some in ANO.